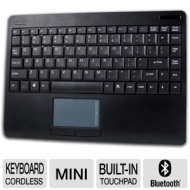 alaTest has collected and analyzed 13 reviews of Adesso 2.4 GHz RF Wireless SlimTouch Keyboard WKB-4000UB. The average rating for this product is 4.5/5, compared to an average rating of 4.1/5 for other products in the same category for all reviews. Some have doubts about the price. We analyzed user and expert ratings, product age and more factors. Compared to other products in the same category the Adesso 2.4 GHz RF Wireless SlimTouch Keyboard WKB-4000UB is awarded an overall alaScore™ of 82/100 = Very good quality. Good-feeling keyboard with a well-behaved track pad. Does what it's supposed to, and it's got good range. Nice-looking, lightweight and slim - but big enough for large adult hands. I haven't had any problems with key placement or functions. Purchased this to use with a WD Live TV media player. Worked right out of the box. No complaints at all. Works great. No drivers. Default numlock is a pain but very simple to work around. I haven't figured out how to change the settings on the actual device to take numlock off of the default settings. All great except the reduced keyboard layout - only one CTRL key, delete key in different place, etc. Look carefully at the layout if you are a keyboard shortcutter, it might not be for you. Work freely, without restrictions of space, angles or distance. This compact wireless SlimTouch mini keyboard is perfect for tight spaces, including living rooms, kiosks/stations, conference rooms, mobile and workgroup project environments. The Wireless SlimTouch Mini touchpad keyboard also features 2.4GHz RF connectivity, an ultra-slim and stylish design with clean lines, and an integrated touchpad eliminating the need for a mouse. The sleep mode and power On/Off switch, allow users to switch their power off while away from their desk, saving battery life for extended use. The Quick Connect button enables users to synchronize their PC with the click of a button. This unique keyboard fits beautifully with desktop PC systems, flat LCD monitors and tablet PCs in modern office environments. Its small, compact size is also extremely mobile, easily fitting in a briefcase or backpack. When on the road, the USB mini-receiver plugs directly into a notebook or another PC providing connectivity up to 30 feet away.